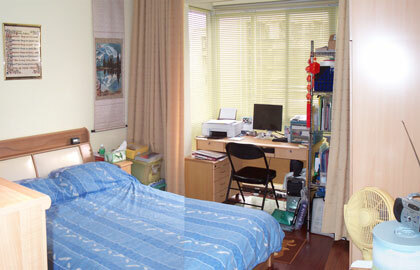 This is where we lived in Kunming (2005-2010). 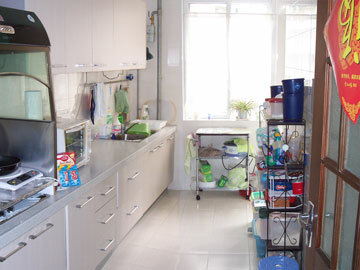 We moved to Kunming in mid-August 2005, with the hope of living on-campus, but by mid-October, we had taken all we could stand of living in a small dorm room (and constantly searching through boxes to find the things we wanted). After searching for a few weeks along the only bus route that passed our campus, we finally found a place in a new complex called Chuan Yi Ying Guo (or "Think UK"). Since the apartment was new, we didn't have to deal with roaches (like we have before and since), but we did have to buy a lot of furniture to go with the few pieces we'd brought from Xi'an. 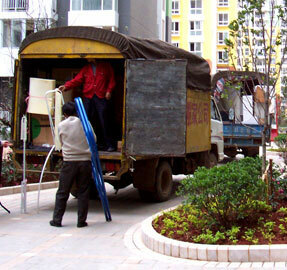 Fortunately, our wonderful landlord bought the furniture when we left for Xiamen, but that's another story! When move-in day came, it took two trucks to haul our stuff over from our "temporary accommodations" on the YNUBS campus. It took another two months to really unpack, buy all the needed furnishings, and decorate. 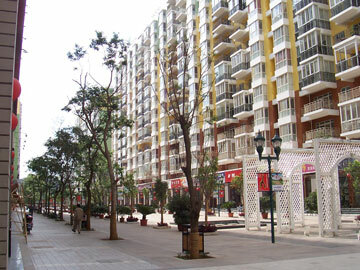 On the right, you see the main complex plaza, with a growing list of shops and services. At various times of day this plaza is filled with exercisers (often in rows, doing the same dance), dogs, or babies, just as you would find in most Chinese pubic parks. It is difficult to get good photos of the inside of an apartment, but I pasted a few photos together to try to give you some idea of where we lived. The living room was huge, and we often had over 20 students around our TV (including a few behind this rail in the raised dining area--shown below). The main door was just to the right of this photo, the kitchen was behind you, and the small hallway (shown) was to the left. Standing in the hall doorway, you are in the master bedroom, looking at Andrew's room. The main bathroom is to the right, to the left you turn into the dining room, the door to the right (next to Andrew's room) was the laundry room (and eventually our dog's home), and opposite the laundry room was my office. 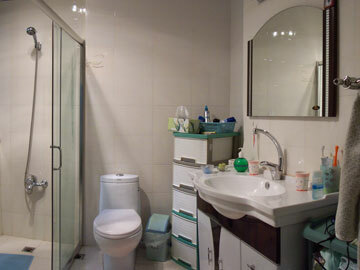 This apartment was the newest, biggest, nicest and cheapest home we'd had in China. If that last word doesn't seem to fit, think of this: every time we have moved in this country, Michael has taken a big pay cut. Shanghai is very expensive by Chinese standards, but we had a nice place of around 90 sq m. In Xi'an, Michael's pay was lower and our 97 sq m apartment was cheaper. Our Kunming apartment was around 110 sq m and was in a new complex; and Michael's pay was considerably lower than it was in Xi'an! If we keep moving, maybe we'll end up with a huge apartment and no income at all. Our next apartment (in Zhangzhou) was actually cheaper, but the following one (in Xiamen) made up for it, as the most expensive home to date! 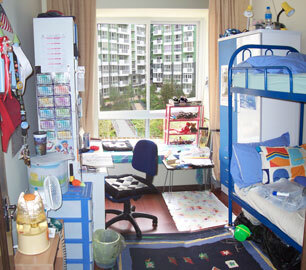 But we loved "Think UK", especially in comparison to the small campus dorm room we had moved from. This was the nicest kitchen we've had in China, too. 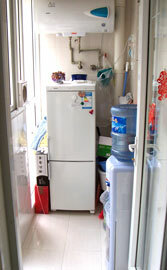 However, whoever designed the kitchen forgot to include a place for the refrigerator. The landlord suggested putting it in the dining room, but we opted to put it (with the water dispenser) in the balcony (which is next to the kitchen window). 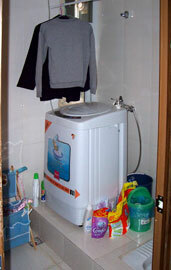 That made them wonder where we would put the washing machine which belongs on the balcony--well, we disconnected the shower beside the "Chinese" toilet and put it there. We only used the squat toilet in emergency situations, until we trained our dog to use it!. This "western" bathroom is just inside the door to the master bedroom. When we arrived, the shower water just splashed everywhere, so we added a glass stall. 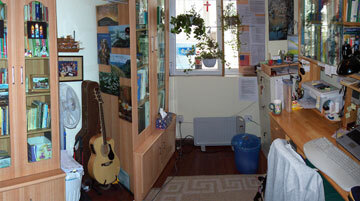 Michael's study was about the size of an American closet (this is four photos, stuck together!). But it was easy to heat in the winter, and we added lots of bookcases, a fast Internet connection and a nice wooden desk to make it comfortable. But Michael certainly does not have a green thumb. He somehow managed to kill all of the plants shown in his window! (In Xiamen he had better success with a cactus!) The refrigerator balcony is outside his window. When we moved in (October 2005) there weren't many other tenants. For six months we asked for an electric bill, but the complex management just kept saying, "Sorry, we don't know how to bill you yet." Every weekend (and throughout the day, every day) LOTS of people were drilling, banging and sawing to prepare their own apartments. Most of that stopped after Chinese New Year (Feb. 2006) as more people moved in. 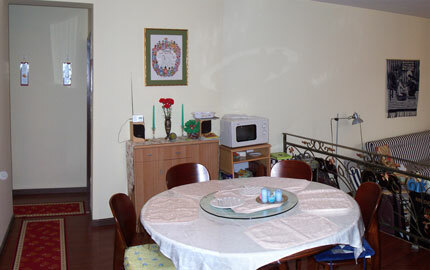 In spite of being surrounded by the city, it is a very quiet place to live or entertain. After moving here, Michael had a 25-minute bus ride to work at YNUBS. (The following three years he could walk to school--until the Medical University moved.) This apartment was also convenient for Andrew's school, until they jacked up the rates so that we had to "home school" in 2009-10. It was also close to the heart of the city, making it easier for Vivian to use busses, helping Andrew get to where he needed to go, go shopping, etc. All in all, it was a wonderful place to live while we "taught and learned" in beautiful Kunming. Think UK is the green and yellow complex looming over a hazy Kunming.  The haze is normal, but we also got blue skies a few days per week, which is a lot better than "a few times per year" in Xi'an. On clear days, we can even see the mountains from our complex.